It’s that time of the year when we start pulling out the sweaters and scarves in anticipation for the new season. Some love the cold, some hate it, but most of us settle within an equilibrium, a love-hate relationship. Perhaps we achieve this middle ground through the plethora of food we feel justified to eat when it’s cold outside. So here are some easy treats you can fix up at that fire pit near your dorm or just in your oven or microwave. Ah, the go-to snack for any fall/winter gathering; the perfect amalgamation of fluffily marshmallow, rich chocolate and crispy graham crackers. There is no doubt anyone remotely interested in food would already know how to make this easy, yet delicious concoction. But here are some tricks to make your s’mores experience even more wonderful than it already is. Instead of hoping the marshmallow is hot enough to melt the chocolate when you piece together the savory sandwich, push a piece of chocolate into the marshmallow nice and deep. This way, the chocolate is already melted and you won’t have to worry about messy chocolate-stained hands. If you’re craving some serious party on a cracker, replace your regular s’mores chocolate with Reese’s for peanut butter flavored s’mores. Normal people know it’s fall when the leaves become a warm palette of red, orange and yellow. Food lovers know when they start lining up pumpkin pies and candy apples. Granted, this candy apple is not going to look like the neatly-packaged ones you buy at the store, but it’ll serve its purpose-tasting like an apple covered in sugar. Candy apples are usually coated with molten sugar candy, so roll around an apple on a clean flat surface, like a cutting board, with just enough force so the sugar embedds into the fruit without crushing it.Once the sugar is melted to your satisfaction, wait a few seconds until it cools down, and bon appétit.If you dig that syrupy taste, then use maple syrup instead of sugar. If you’re yearning for a healthier option, use honey. But if you’re not a fan of candy apple, here’s an easy baked apple recipe. For this little treat, you are going to need some kitchen appliances: knife, spoon and tin foil-the thicker the better. Pick the largest orange you can find, cut the top of it and scoop out all that Vitamin C goodness-you won’t be needing it. Once the fruit mildly resembles an oval bowl, fill it with brownie mix , wrap it in tin foil and throw it in the fire pit. But don’t actually throw the orange brownie, place it by one of the logs, or where it will heat up the fastest. 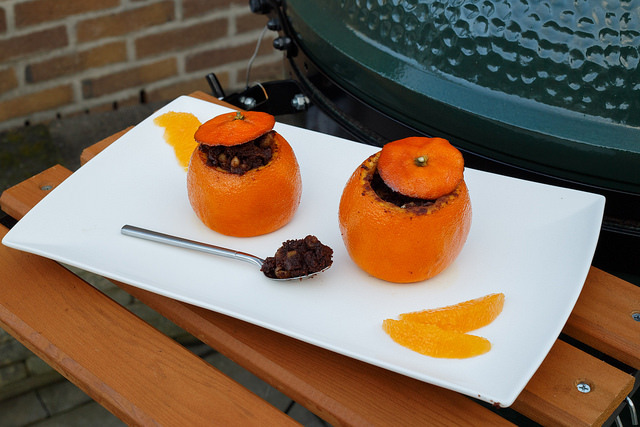 Give it a few minutes to cook, and voila, you have a spoonable brownie in an orange!